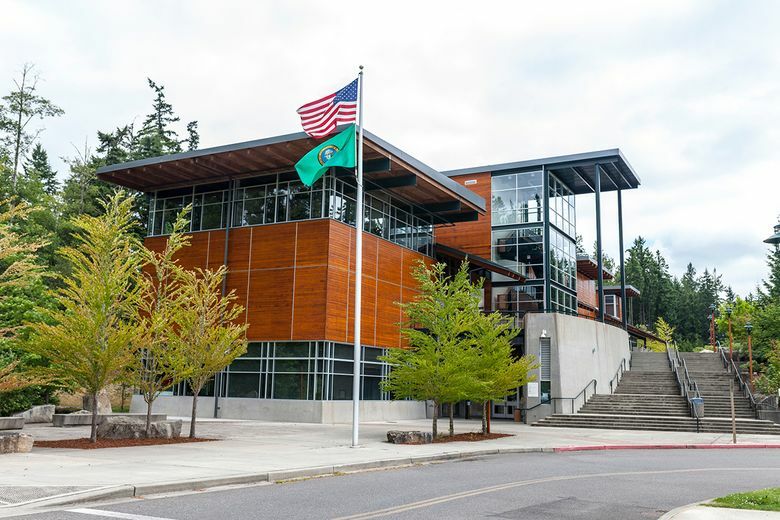 Western Washington University Center at Olympic College in Poulsbo is the result of the partnership of WWU and OC to create a place for students in Kitsap and the surrounding area to have access to high-quality baccalaureate degrees. Partnerships and community collaboration make it easier for adult learners to get to class. Many people are hungry for four-year degrees that could help them make the next move in their careers, but first they must figure out how to get to a college campus despite soul-crushing traffic congestion and the need to stay close to home due to family or work. In a growing, competitive job market, college degrees are more than a line on a résumé; they are a minimum requirement for a good job. “There are about 700,000 adults in Washington who have earned some college credit, but haven’t completed a degree,” says Sabah Randhawa, president of Western Washington University. “We need to be closing that loop and providing resources and opportunities for those 700,000 people to invest in their futures, and really, all of our futures as citizens of the state of Washington,” Randhawa says. About 51 percent of the state’s adults have some sort of postsecondary degree or credential, according to the Washington Student Achievement Council, but in the next decade, the state needs 70 percent of adults to have a post-high school credential or degree in order to maintain the state’s economic growth. The gap is even more dramatic in areas that aren’t home to four-year college campuses. In Kitsap County, for example, 41.3 percent of adults have a two-year degree or more, according to the U.S. Census. In Snohomish County, it’s 40.4 percent. Universities are responding by bringing programs to students who can’t attend at the main campuses. They’re building university partnerships and supporting community and transportation infrastructure to connect these regions. Typically, the students who enroll in regional degree programs are older, 30 to 55, with jobs and families. “They’re not in a position to pick up and enroll in a university out of town,” says Lois Longwood, a senior director of Western Washington University’s Extended Education programs in Snohomish County. Western Washington University’s 10 locations throughout Puget Sound include partnerships with other higher-education institutions and community organizations, especially in Kitsap County, where students must otherwise ride a ferry or cross a bridge to get to a four-year college campus. For example, Western partners with Olympic College to provide Kitsap Peninsula residents with opportunities to earn their bachelor’s degree in Bremerton and Poulsbo. High-demand programs like cybersecurity and environmental science are included in the expansion efforts. The state’s first cyber range, a controlled virtual environment for training in cyber warfare defense and cyber technology, will open in Poulsbo as part of Western’s Computer Information Systems Security program. Program director Erik Fretheim says the cyber range will be accessible to other universities and private industry, making it a valuable resource for learning throughout the region. Space in Everett Community College’s two residence halls for students in Western’s 12 bachelor’s and master’s degrees and related certificates. Rent covers rooms, utilities, Wi-Fi and 24-hour support from live-in staff. This provides a huge advantage in a tight rental market. The Everett University Center, a 95-000 square-foot facility equipped with state-of-the-art technology, where students and community members can attend many courses offered by Western and other university partners. More diverse offering of evening and weekend classes to accommodate busy lifestyles. For example, Western’s Weekend MBA program meets for 20 weekends a year, making an advanced career obtainable to more people. Local business leaders are delighted by efforts to bring more higher education access to their communities, says Szymanowski, who has been working closely with Kitsap business leaders to build private support for Western’s regional programs. Kitsap Bank, for example, has committed to funding two scholarships for the next five years for Western students in the Kitsap area, Szymanowski says. And bringing higher-education opportunities to smaller cities does more than develop workers for established businesses, Longwood says. Many students who are committed to staying in their communities come to college to build credentials and social networks for entrepreneurial ventures that benefit the whole community, she says. In addition to degree-seeking students, some of the extension campuses offer services for the broader community. The SEA Discovery Center on Poulsbo’s waterfront provides research opportunities for environmental science students, as well as youth programming, community lectures and non-credited workshops for adult learners. Western Washington University offers a variety of degree options at various locations throughout the state, in addition to opportunities to impact communities. To learn more about available programs in your area, go to wwu.edu/locations.